Officially announced two days ago, the LG G3 is currently available to buy only in South Korea, with a global launch to follow starting June. Even so, unboxing videos already started to show up, so we thought that you might be interested to see them. We spotted two LG G3 unboxing videos, one of them officially coming from T-Mobile, and another one showing the handset’s Korean version (for SK Telecom). As you’ll see in the videos, the Korean model has two removable batteries and a pair of headphones, while the T-Mobile variant has only one battery, and (apparently) no headphones at all. That’s why the retail box of the Korean G3 is bigger than the one of the smartphone for T-Mobile. Interestingly, although the retail boxes have a gold color, both smartphones found inside are of the metallic black variety - so perhaps all retail boxes are golden, regardless of the handset’s color. You can find the two unboxing videos in the slideshow below. And you should definitely also see our LG G3 hands-on (which includes lots of photos, as well as two videos). the korean version is better w/2 batteries /charging port too. Korean version are better and exclusive. Remember the S4 with S800 Cpu, and the rest of the world got the S600 Cpu. No wonder the S4 S600 use to log and the S4 S800 didn't lag. The S800 version is also available in Australia on Vodafone and Telstra Network. 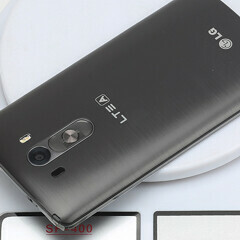 It is known as i9506 and is a Cat4 LTE advance version, which is capable of up to 150mbps. It has been available since august-september last year. I never used the cheap pair they put in the box anyways, I'd always use my own pair. The Quadbeats by LG are not just a "cheap pair". They are excellent in terms of Sound quality. Why is it so hard to buy your own earphone. It would probably be a better investment over the long run anyways. It's a nice option to have out of the box that's why. Sure but it's not really a "fail" and LG is not giving the U.S. "sh@t". Besides, american consumers pay less for phones than many countries around the world. But necessary to those like him. There's two sides to this and obviously people prefer headphones to come with the phone. Plain and simple. I am not from the USA but I imagine that because the phones are subsidised, Carriers are forced to go with the bare essentials. Then explain why my S5 and my Note 3 came with headphones. This guy should of at least clean his Cuticles before doin a unboxing. I'm Korean and leaving in US now. I can tell the korean version is always much more expansive than US version. that's the important thing. Are you doing that on purpose? Koreans are usually good spellers. Great idea! Metal box with plastic phone inside!